- 2 mm wall thickness. Outer diameter 88.9 mm. The brand AISI 201 is distinguished by anti-corrosion resistance at a relatively low cost, belongs to austenitic steels, is a chromium-nickel alloy. The pipe has significant strength and wear resistance. 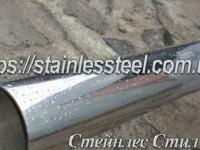 This stainless pipe is resistant to medium aggressiveness. Easily amenable to arc welding and cold working. The length of the pipe is 6 meters (standard value for these products). The properties of the pipe provide it with widespread use in industry and everyday life. It is used as elements of heating, plumbing, ventilation systems. Due to the corrosion resistance of the pipe 88.9 mm in demand in the chemical industry, is used for the production of local pipelines in enterprises. Оформила заказ через сайт, перезвонили и проконсультировали быстро. Товар смогу забрать уже завтра. Менеджер вежливый. Рекомендую компанию. Трубы отличная, "зеркало" хорошего качество (соответствует 600 grit), шов идеальный.